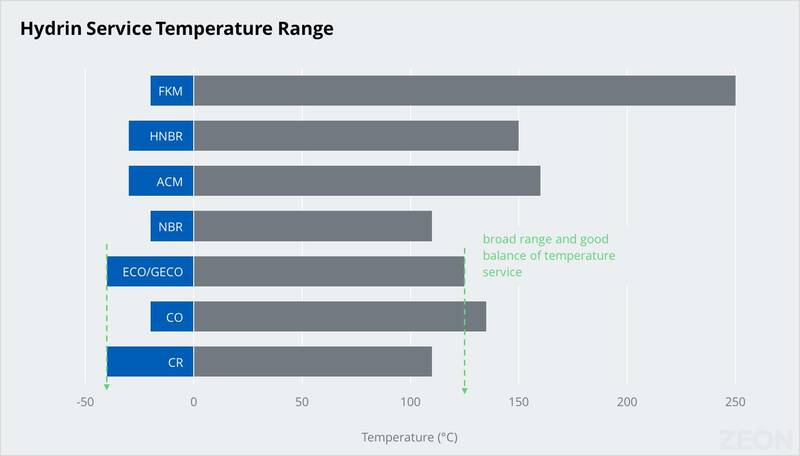 Hydrin® epichlorohydrin (ECO) elastomers provide an excellent balance of heat (125°C), oil, fuel, and ozone resistance with superior low temperature flexibility. Hydrin is broadly used in automotive fuel hose, air ducts, A/C, and vibration dampening. Its electrical properties benefit laser printer rolls. Hydrin is classified as a CH polymer according to SAE J200 / ASTM D2000. 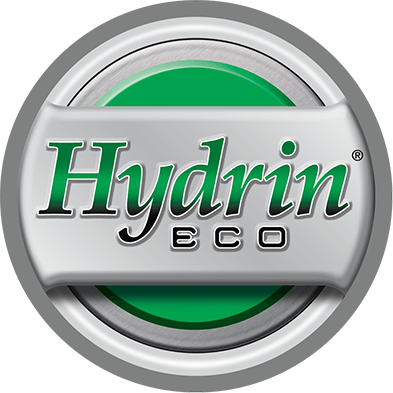 Hydrin ECO offers a unique combination of fuel resistance and low-temperature flexibility. 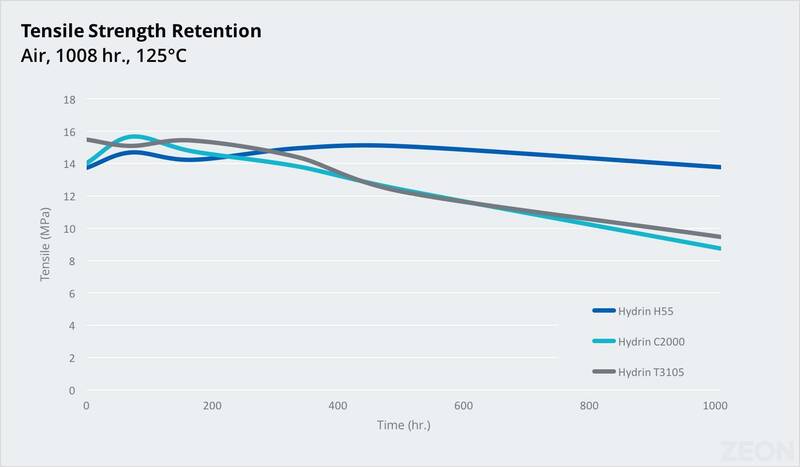 As illustrated, Hydrin has resistance to Fuel C that rivals a 50% ACN content nitrile rubber while still possessing a glass transition temperature of -41°C. Hydrin withstands prolonged heat exposure to 125°C. Tensile strength is maintained after 1008 hours, 125°C exposure and hardness is minimally changed. Hydrin H series is suggested for applications needing prolonged heat exposure. Hydrin is inherently and permanently static dissipative. 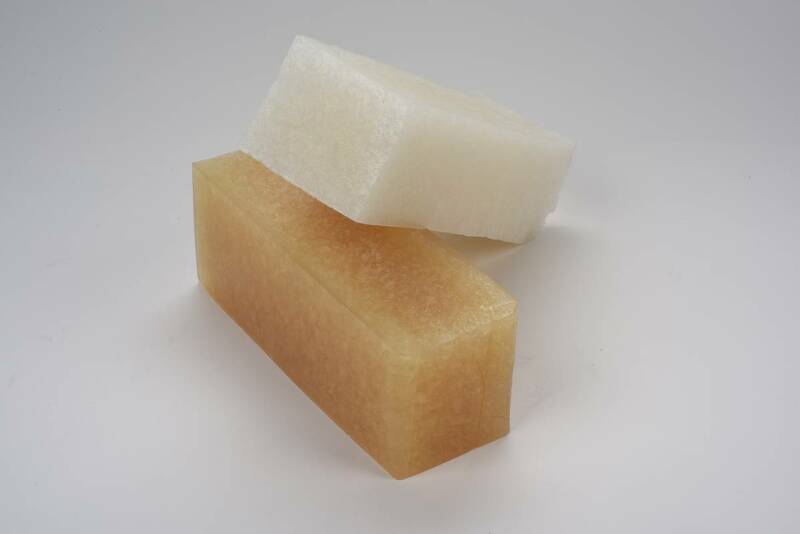 Its polyether backbone provides conductivity, making it one of the most dissipative polymers available. These electrical properties remain uniform across molded articles. Hydrin can be compounded to achieve resistivity values as low as 3 x 105 ohms without the addition of conductive additives. Hydrin is an excellent alternative for chloro-sulfonated polyethylene (CSM) and polychloroprene (CR) rubber. Hydrin’s resistance to diesel and bio-diesel fuels is superior to that of CSM. Compared to Hydrin, CSM suffers from loss of tensile strength and high level of volume change. As shown in the second table, heat resistance is similar to CR rubber. Hydrin’s excellent resistance to hydrocarbon fluids and fuels make it ideal for air intake systems incorporating exhaust gas recirculation or engines with moderate to high levels of blow-by products. Automotive clean air intake ducts benefit from Hydrin due to its desirable balance of performance at a broad range of temperatures from -40°C to +135°C. 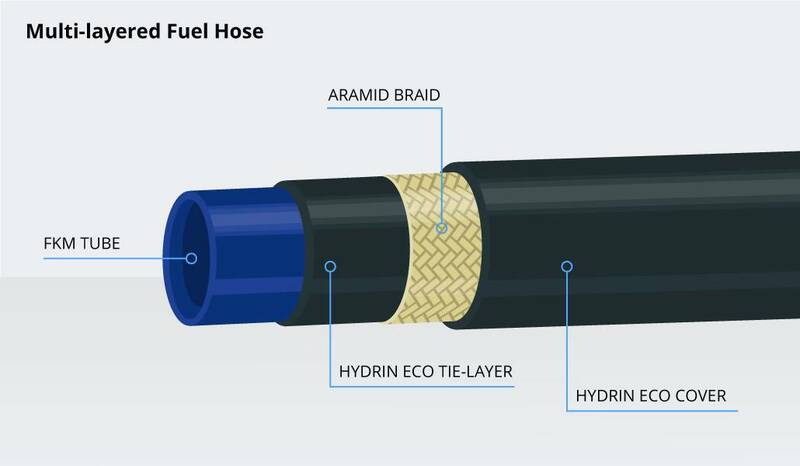 Hydrin enables lower cost fuel hoses compared to other constructions. 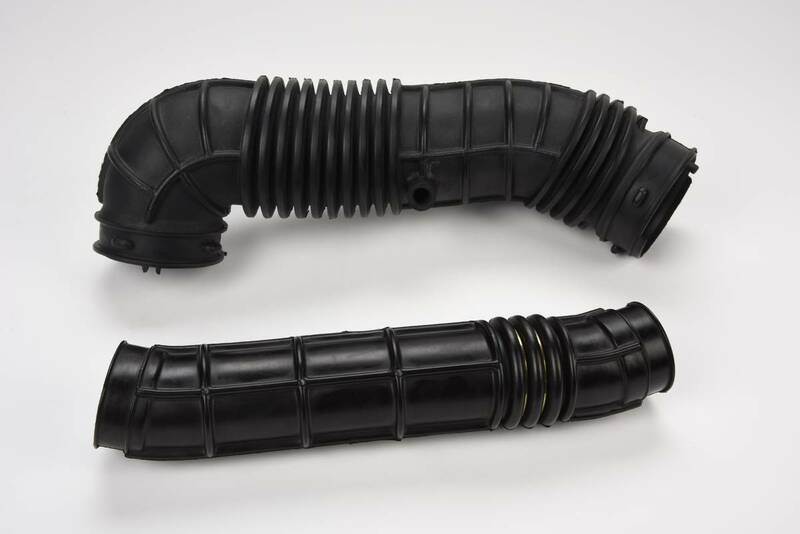 Mono- and multi-layer fuel hoses are common applications of Hydrin. 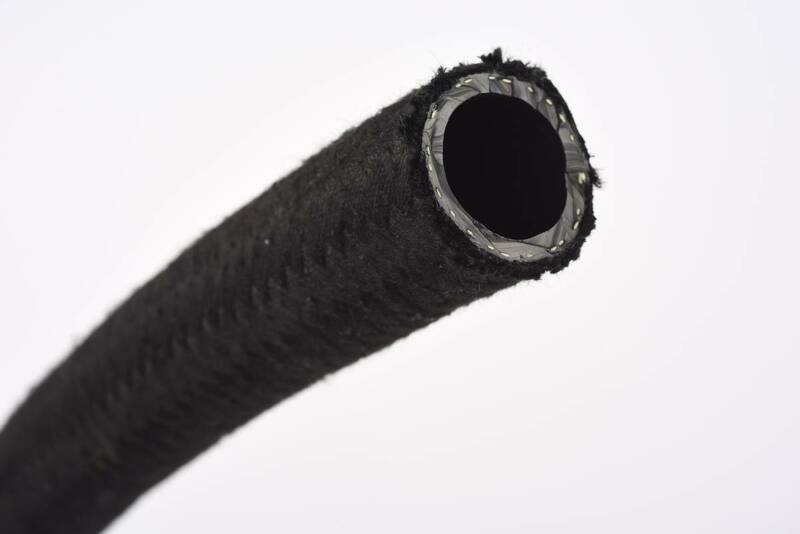 In multi-layer hoses, bis-phenol cured Hydrin provides excellent adhesion to the FKM inner layer and reinforcing braid while the terpolymer series of Hydrin is utilized for the cover layer. A common multi-layer construction is: Inner [bis-phenol cured FKM] | Tie Layer [Hydrin C2000 copolymer + Braid] | Cover layer [Hydrin T3105 terpolymer]. Hydrin PX and Zeonex PB are bond agents specially designed to promote adhesion to peroxide cured FKM and bisphenol cured FKM, respectfully. The inherently static dissipative properties of Hydrin make it useful for both charge and developer rolls in laser printers and paper copier machines. 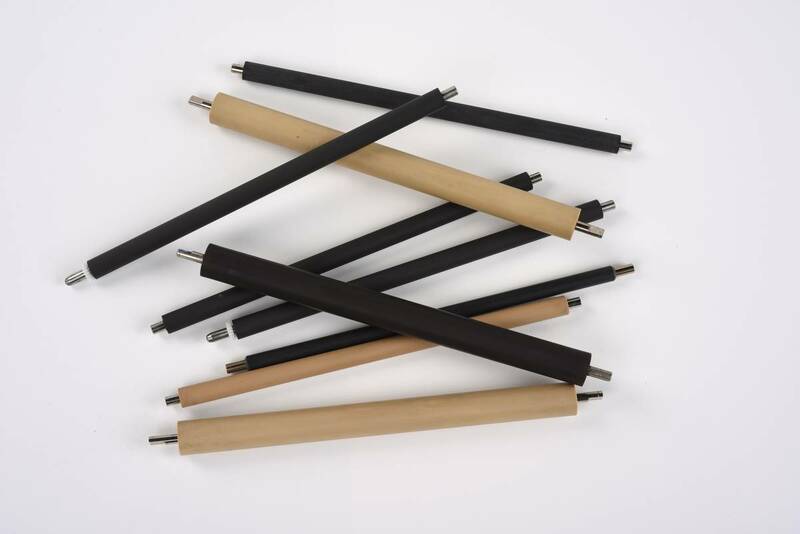 The electrical resistance is consistent along the length of rolls made with Hydrin, which enables reliable, long-life print quality. While other elastomers require conductive additives, which may leach out and degrade over time, Hydrin is inherently static dissipative. Polychloroprene rubber (CR) can be replaced with Hydrin in a multitude of applications including seals and air springs. Hydrin fully meets ASTM D2000/SAE J200 ‘BC’ and ‘BE’ requirements. H45 40-50 1.37 -21 Outstanding permeation resistance to helium, hydrogen, nitrogen, air, and carbon dioxide. H55 50-60 1.37 -21 Outstanding permeation resistance to helium, hydrogen, nitrogen, air, and carbon dioxide. H65 60-70 1.37 -21 Outstanding permeation resistance to helium, hydrogen, nitrogen, air, and carbon dioxide. H1100 52-65 1.35 -26 Outstanding permeation resistance to helium, hydrogen, nitrogen, air, and carbon dioxide. Can be sulfur or peroxide cured. C2000 90-102 1.28 -41 Fuel pump diaphragms, hose, coated fabrics and vibration mounts. Can also impart antistatic properties to plastics. C2000M 75-90 1.28 -41 Medium viscosity version of C2000. C2000L 65-75 1.28 -41 Low viscosity version of Hydrin C2000. C2000LL 53-65 1.28 -41 Lower viscosity version of Hydrin C2000. C2000XL 40-52 1.28 -41 Lowest viscosity version of Hydrin C2000 for optimal injection flow. T3000 80-94 1.28 -43 Terpolymer of ECH/EO/AGE. Sulfur-curable, and can be blended with other elastomers. T3000L 65-79 1.28 -43 Low viscosity Hydrin T3000. T3000LL 50-64 1.28 -43 Lowest viscosity version of Hydrin T3000 for optimal injection flow. T3100 63-77 1.31 -36 Highest AGE content terpolymer for enhanced cure state and ozone resistance. T3102 80-100 1.31 -38 Highest ECH content terpolymer for improved heat and ozone resistance. T3105 70-80 1.29 -41 High ECH and AGE content terpolymer for improved ozone resistance. T3106 53-67 1.26 -48 Higher EO content polymer giving enhanced electrostatic dissipative properties. Designed for laser printer rolls. T3108 40-54 1.23 -48 Highest EO content polymer, giving even lower volume resistivity. Intended for electrostatic dissipative applications. T3108XL 10-25 1.22 -48 Improved processing and low hardness version of T3108. Lowest hardness, electrical resistivity, and specific gravity of any Hydrin product. Designed for laser printer rolls. T5010 75-100 1.27 -40 Has the best mill release and processing. Can be sulfur or peroxide cured. PX NA NA NA An adhesion promoter for Hydrin compounds to aid in bonding to FKM, nylon, and other rubber compounds.